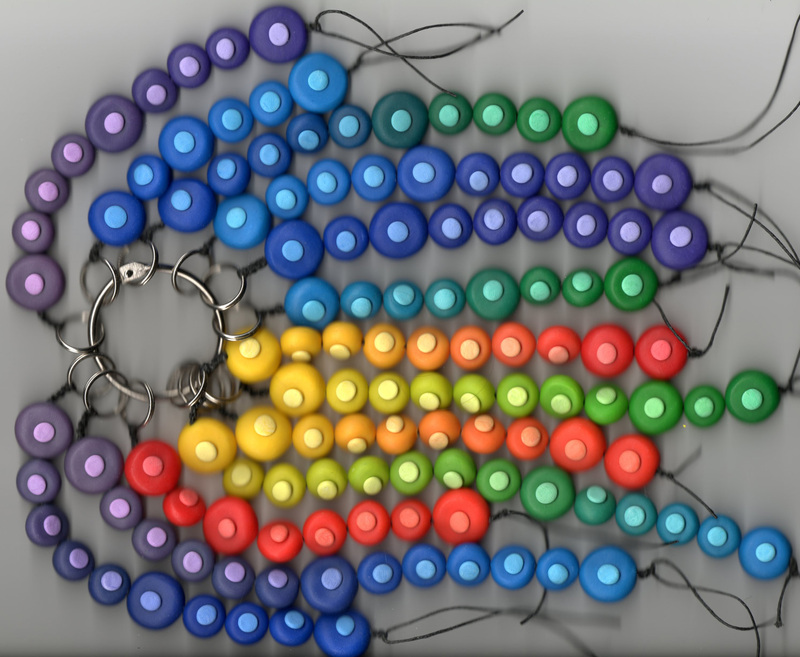 A Rainbow hued group of color scale beads. 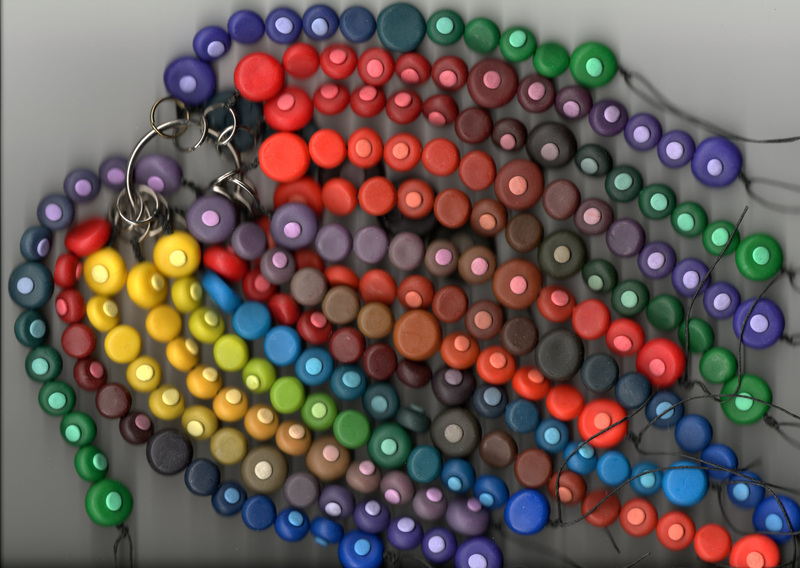 And a Chromatic gray (or muddy) hued group of color scale beads. My personal favorites. I used Kato clay to make these beads which are mixed in a geometric progression of one color to another. Using the geometric progression proportional method covered in the book saves a lot of clay and results in very usable color palettes. I used Kato exclusively because it is formulated specifically for mixing colors and doesn’t experience the hue impurity and color shift problems encountered with other brands. Here’s what I learned while making these scales. 1) A pasta machine is an absolute necessity. I’d already bought mine years ago to save my hands/wrists from the trauma of conditioning clay but personally wouldn’t even attempt this project without one. 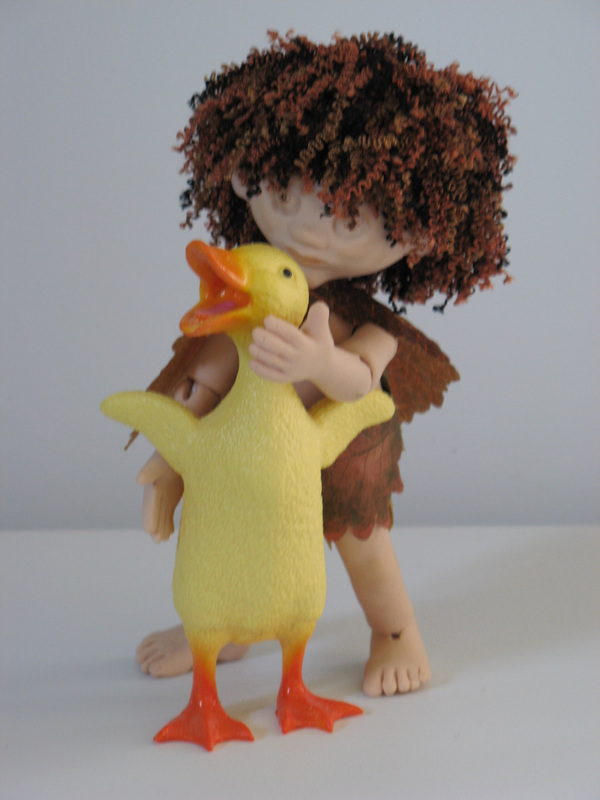 2) Get all the really tedious bits done first. Condition, sheet and cut all your clay into measured bits (I used a 3/4″ square cutter at the thickest sheet setting). Stack all the little squares, wrap up and store in zip-lock baggies. Do this in lightest to darkest color order. Then when you’re ready to mix a few strands everything is ready and measured. 3) Pierce the beads as you finish each mixed strand; I left a few strands until the next day and several beads cracked. Place them on the baking sheet in the mixing order and string them directly from the baking sheet. Order must be preserved! Otherwise you won’t know the correct proportion of colors to mix and that is the whole point of making them in the first place. 4) Choose something very strong to string them. I used a doubled strand of black waxed linen thread from the jewelry department of the local craft store with a double jump ring header so I could bunch them on split book rings to keep them organized. 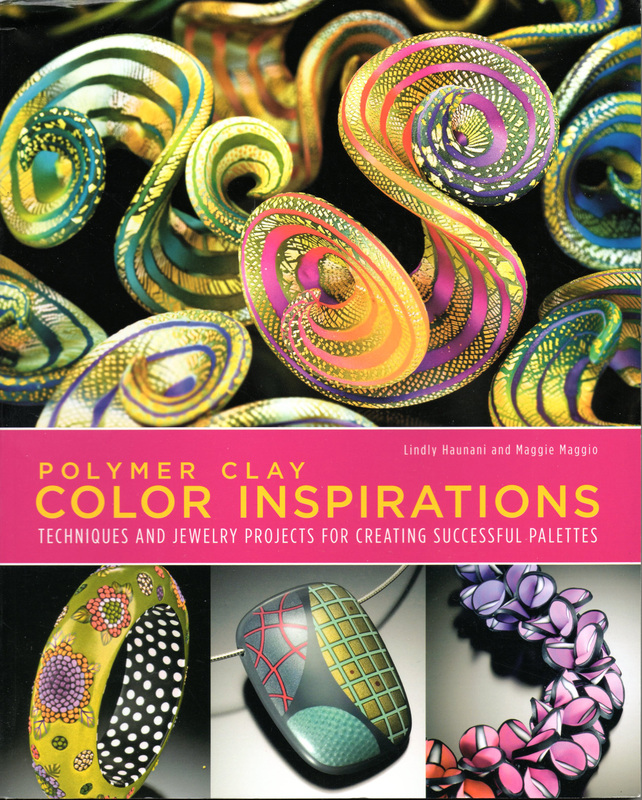 My beads are made using an onlaid color dot of 50/50 white and the color of the base bead instead of the inlaid color dot technique used in the book. Again I conditioned and sheeted (at a thin setting) all the white I needed then stored it between waxed paper on paper plates to be used as needed. I used a section of plastic drinking straw as a cutter for these pastel onlays. While the initial purpose of making these color scale beads was to end up with a tool for selecting color mixes I have to say that the end product is a very satisfying and aesthetically pleasant handful of science. Beautiful, colorful science.